From tiny handbags for purses and keys to large rucksacks carrying enough for a camping weekend, bags are essential tools for everyday life. 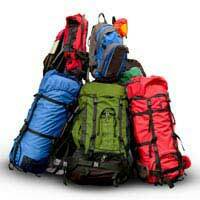 The bags that everyone carries every day – rucksacks, backpacks and handbags – can add up to quite a weight. Try putting them on the bathroom scales and see how much they weigh. Carrying heavy bags regularly can lead to back, neck and shoulder pain, and may increase the risk of arthritis. Backpacks are the ideal way to carry things, as they designed to spread the weight evenly over both shoulders, allowing the back and abdominal muscles to bear the weight. An ideal backpack should be lightweight when it’s empty, have a padded back panel and wide, padded shoulder straps, and have lots of compartments to help spread the load. Carrying a heavy backpack over one shoulder pulls the shoulder down and tends to make the wearer lean sideways to compensate for the weight – make sure that backpacks are always worn over both shoulders. Even backpacks shouldn’t be too heavy – a heavy pack pulls the body backwards, so to compensate, people tend to bend forward at the hips or arch the back, putting a strain on the back and neck muscles. Like carrying a rucksack or backpack on one shoulder, a heavy handbag can pull the spine out of line, straining the muscles of the back, and make the person carrying it lean in the opposite direction to compensate for the weight. Carry the bag on alternate shoulders on alternate days, and try to keep the shoulders level and stand up straight. If the strap is long enough, pass it over the head so that it rests on the opposite shoulder, to distribute the weight more evenly. The bigger the bag, the more tempting it is to fill it up. Is everything in the bag absolutely necessary? Have a good rummage through (or even turn the bag out on the floor) and go through the contents – can the receipts be thrown out (shred or compost anything with personal information) or filed? Do all the pens work? Is there more than one notebook in there? Is the large water bottle absolutely vital, or would a smaller one that can be filled up at the tap do the job just as well? Can some of the change be cleared out of the purse, and are all the keys current, or are some of them obsolete? A study in 1999 showed that more than a third of Italian schoolchildren carried bags that weighed more than 30% body weight at least once a week, with some children carrying bags that weighed almost half their body weight. In 2009, the back charity BackCare said that around 80% of children have bags that are too heavy and carry them on one shoulder. This, along with other factors such as poor designs of furniture, leads to about 15% of children needing medical help for back pain. The charity suggests that bags should weigh no more than 10% of a child’s body weight, and be carried over both shoulders, not just one.